Be the first to hear about their new releases and deals. Download the Booksprout app and search for Mia Bishop today! Mia Bishop lives in Colorado with her husband, two boys, and enough animals to fill a small zoo. 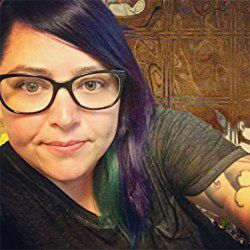 She writes Paranormal Romance, Romantic Suspense, Urban Fantasy and Sci-Fi to fill the time between library trips, hiking, and camping in the high desert. Besides being a mom, wife, and author- Mia is also a dedicated pet wrangler, zombie apocalypse prepper, coffee addict, & all around crazy person. A geek at heart, Mia indulges in all matter of nerd culture. When not writing, she can be found with her nose in a book or graphic novel, watching anime, playing video games, or binge-watching Netflix. Even when camping there is usually a device or book in hand. The key to Mia's heart can be won with anything Whovian related, tickets to ComicCon, or a '67 black Chevy Impala.